In fall 2013, I was living in an apartment in Brooklyn with my husband, our cat, and the 24-hour roar of the expressway next door. I’d recently peaked out of a graduate creative writing program, quit my job, and started on an overhaul of my memoir, funded by money not spent on grad school. To complete my revision by the deadline I’d set, I needed to spend many hours per day alone—which would have been fine, except that when I emerged from seclusion (usually sometime in the afternoon) I had trouble finding company. Most people, including my husband, were at work. For money. Even evenings and weekends, I struggled against the sense that my friends were too busy for me, and shrank from the anxiety-ridden task of making appointments. I dreaded having to sell my time for money again, once my savings ran out; I acknowledged my social starvation. And I noted a deep yearning for a new story of joyful contribution to a supportive community, enlivened by a stream of easy interaction. Enter the Gift Circle—a pattern developed by Alpha Lo and friends in Fairfax, California and popularized by author and speaker Charles Eisenstein. In Sacred Economics (Evolver Editions, 2011), Eisenstein offers both a glimpse of a life-serving economy based on gift and connection, and release from the belief that financial struggle bespeaks a character flaw. In his view, the economy as we know it—which creates money as debt—thrives on, and therefore rewards, extractive activity that turns the commons (air, water, soil, bodies, attention, culture, relationships) into cash. It wants us to clearcut a forest rather than preserve it for wildlife, to monocrop cattle feed rather than tend a biodynamic farm. However, he shows, it is possible to reverse monetization (aka “development”) by feeding a sacred economy based on a shared belief in life as the original gift from which all bounty flows. Practicing mutuality—giving joyfully and prolifically to the whole—we can trust that it, in turn, will give to us. In a Gift Circle—as described by Eisenstein in a piece for YES! magazine—a varying number of people come together to make requests and offers, and express gratitude, especially for gifts received through previous meetings. It sounded like a perfect way to gain company while reducing my need for money. Unable to find a Gift Circle already growing in Brooklyn, I decided I would start one. The Brooklyn Gift Circle, hosted by the Brooklyn Society for Ethical Culture, met once a month, with a summer break, from February 2014 through June 2015—a total of 15 times. In all, more than 50 people attended at least one Circle; Circles ranged in size from two to 16. Gifts given included: A phone cord, a Kindle, an iPod. Magic mushrooms, basil plants, a poster painted by hand. Use of a saw, a planer, an expedition-sized backpack. Cat-sitting, housecleaning, healing bodywork. Counseling. Gardening and career advice. Help avoiding eviction and securing an apartment. Help with moving and household chores. A job as an arborist. A blind date that bloomed into a months-long relationship. A series of Craft Nights allowing us to mend, knit, whittle, paint, in company. In each match, I rejoiced—but what mattered most to me were the ties formed between giver and receiver, the agape bred by our spiraling generosity. I saw that the Gift Circle, at its best, was friendship in reverse: Friends request and offer help within an existing sphere of knowledge and regard; Gift Circlers come to know and care for each other through requests and offers. Yet when my husband and I left Brooklyn for Beacon, New York (a tiny city 70 miles up the Hudson), in spring 2015, I did not start a new Circle. Yes, I’d wearied of the administrative burden (posting and emailing announcements, making fliers, maintaining a mailing list, taking and circulating notes) and the screen time it required, and yes, Beacon had thriving Facebook groups facilitating hyperlocal hiring, buying, selling, trading, and giving away. But mostly I held back because my original yearning had morphed into something more: a vision of a village where frequent, casual contact, combined with intimate knowing of needs and capacities, supported giving as a way—or at least a major part—of life. I both cherished this vision and dismissed it as impossibly distant. It did not come up when a friend mentioned, at a sewing meetup, that she was planning a weekend trip to visit a mentor at Earthaven, an aspiring ecovillage of about 55 members on 330 acres in Black Mountain, North Carolina; what did come up was my curiosity about this community, which I’d first heard of while living at Zendik Farm, in nearby Mill Spring, in the early 2000s. My five years at Zendik—during which I’d renounced the outside world, or “Deathculture,” and surrendered self-trust—had turned me against group living; I was not planning on sharing a kitchen and bathroom with strangers ever again. But, having recently completed the final draft of my memoir, and the second season of a writing gig that had become my main source of income, I could afford to go on a jaunt, just because. 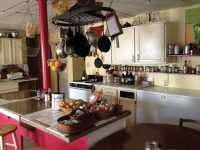 I arranged to stay at Medicine Wheel, a collective house that often hosts visitors to Earthaven; my friend and I scheduled our journey for the first weekend in March. 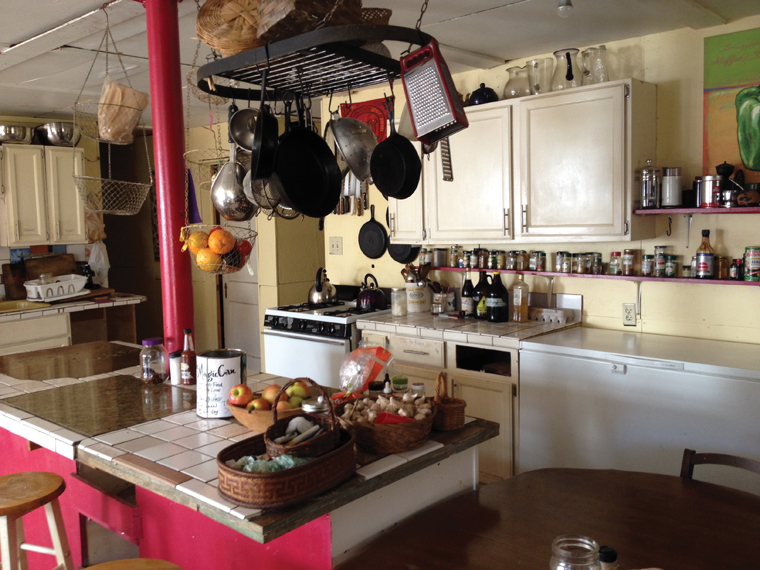 What struck me first, when I stepped into Medicine Wheel’s spacious kitchen/dining room, the morning we arrived, was a surge of warmth and welcome. Colorfully tiled counters, floors, and backsplashes, plus quirks like movable ceiling panels and a hot pink post rising through a central island, revealed the loving particularity—and exuberant peculiarity—with which this house had been built. South-facing windows let in floods of winter sun. Resting on the bench by the greenhouse door, after my friend had left for her mentor’s place, I imbibed the blessed quiet, while noting all I wasn’t hearing: The roar of engines. The blare of sirens. The hum, squawk, trill of people’s electronic prostheses. I heard, instead, voices from the floor above, footsteps overhead. I felt the embrace of a space infused originally, then over and over, with the touch of human hands, the care of human hearts. That evening I joined two residents and another visitor in preparing dinner, which we ate near the wood stove. Sharing food—as well as nourishing conversation—with these three women, all of them lively and present, I noticed, and lamented, how accustomed I’d grown to dining with just my husband, or alone. Over the next couple days, I further observed that people seemed less hurried here, freer from distraction. That the lack of heating in bedrooms brought us together, in relaxed congress, around the fire. That the permanent residents, or core group, seemed both willing to invite others in and fully committed to stewarding their home. Early Monday morning, shortly before leaving to return to Beacon, I listened (with permission) to Medicine Wheel’s weekly meeting, during which residents check in, choose cooking and cleaning shifts, address house and kitchen concerns, discuss comings and goings, and so on. As they gathered ’round the stove, I saw that the imprint left by other such meetings (at Zendik, at my college co-op) was leading me to expect veiled hostility erupting into fiery accusation; deadlocks over petty conflicts; torturous meanders bound for dead ends. Ineffectuality branded as égalité, or crucifixion by hierarchy—I’d seen no middle path. So I was delighted, in this meeting, to witness care for self, care for others, care for the whole. The check-ins, brief but not rushed, came from the heart. When voices rose in disagreement, those raising them were quick to step back, acknowledge the upset, seek its underlying cause. When one admitted to feeling overloaded, others offered relief. As the wall-mounted chalkboard at one end of the dining room filled with cooks, cleaners, projects, events, my heart filled with desire to belong to a body like this one. At Earthaven, you can stay up to two weeks (as a guest) or at least two months (as a New Root). Sensing that, cicada-like, I was reviving the tribal dream that had led me to Zendik 17 years earlier, I rented a room at Medicine Wheel from late April through late June 2016, then returned for another two months in early December. Each week, Medicine Wheel renters serve as chef for one dinner, and sous chef for another; take a turn tidying up, or day-cleaning, the main common areas; and spend two hours on tasks like gardening, gathering kindling, splitting wood, bringing order to a space suffering from clutter or neglect. Renters also do chores, like sweeping the pantry or cleaning a bathroom. (I volunteered to help process humanure—something I’d known about for years but never experienced.) In addition, all New Roots owe Earthaven—the village encompassing Medicine Wheel and a dozen or so other neighborhoods—16 hours of service per month, which translates into 16 units of the community’s currency (or CurrentSee), the Leap, usually valued at one hour of labor or 10 dollars. To earn Leaps, I joined semiweekly work parties organized around projects like leveling a group campsite, revising campground signage, pulling up runaway honeysuckle, and weeding the flower beds flanking Earthaven’s main gathering place, the Council Hall—then recorded my hours on my Leap sheet for the month. I also earned paper Leaps—which function like cash, rather than credit—by serving private entities within the village. For example, I sifted clay and repotted saplings at the Useful Plants Nursery, and weeded a strawberry patch bordering a fledgling orchard. Some paper Leaps I put towards my service requirement; others I spent on things like an organic cotton bra top made by the seamstress next door, a jar of pickled garlic scapes grown on site, and a series of homeopathy classes. The Leap, I found, has real value. And I love how Leaps feel. There’s a tradition—sporadically followed—of recording on the backs of paper Leaps the months and years of transactions, their nature, the parties involved. I was thrilled, early on, to receive a four-Leap note with entries dating back to Earthaven’s infancy, in the mid-’90s. And I know, each time I earn or spend Leaps (motto: “In Each Other We Trust”), that I’m strengthening an economy allied with land and living beings—rather than a debt-based cancer programmed for biocide. Which is not to say that Earthaven’s economy is all joy and frogs and bunnies—it can’t be, so long as the infinite growth myth continues to chomp the planet it’s part of. While cash requirements can be fairly low—e.g., $200 per month for my room at Medicine Wheel, plus $230 for food and $35 in Earthaven fees—the few job opportunities on the land are either seasonal or extremely part-time. This means that most residents rely on some combination of savings, investment income, government benefits, work they must drive to, seasonal or occasional gigs far away, telecommuting, and their own entrepreneurial efforts. I’ve financed my stays at Earthaven by editing college admissions essays—something I can do anywhere, provided I have internet. In the long term, Earthaveners may develop more village-based businesses and/or decrease cash needs by further shifting reliance from industrial civilization to each other and the land. Meanwhile, I do see upsides to the scarcity of steady employment: It encourages interaction with the wider world, promotes variety in life design, selects for ingenuity, and discourages the kind of financial dependence that can hinder those who are unhappy in a community from rejoining the mainstream. Though economics has come to mean the study of monetary wealth, it is rooted in care of the home—a pursuit that can bring us together, or keep us apart. In my city life, I mostly cook and clean alone. I pay to have my pee and poop funneled to a “treatment” plant where chemical additives turn it into toxic goop. For morale boosts while tidying and organizing, I rely on steady infusions of country music. Yes, I attend Monday-night sewing meetups, and show up for Weeding Wednesdays at Beacon’s community farm. But, for the most part, I must make an appointment, if I wish to share work, or my heart, with someone other than my husband. This—combined with the omnipresence of screens as an intermediary or substitute for contact—primes me, still, for social malnutrition. At Medicine Wheel, on the other hand, shared home care—in tandem with the absence of cell service and wireless internet—offers abundant opportunity for social nourishment. Cooking dinner for the house, I’m usually working with one or more partners, and chatting with whoever’s around. While cleaning, I’m often hearing others’ conversations, or holding one of my own. Before dumping my first poop bucket, as an apprentice poop harvester, I requested a play-by-play of what to expect from a veteran humanurist with whom I’d yet to make a strong connection; this was the beginning of a pootiful friendshit. And even when I work solo, on tasks requiring close concentration (like organizing our hailstorm of a tool room, or writing this piece), I feel tied to the whole. Each moment brims with chances to serve, connect, receive, know, and be known. To feed, and be fed by, an ever-growing gift-flow. Helen Zuman, writer and gift economist, tends her nodes in the web of relations while seeking a cure for social starvation. Mating in Captivity, her memoir of five years at Zendik Farm, is due out from She Writes Press in Spring 2018. Raised in Brooklyn, she divides her time between Black Mountain, North Carolina and Beacon, New York. Visit her online at helenzuman.com.